employed, usually at power station, also in G.P.O., to examine condition of electrolyte and plates in cells of an electric battery; keeps cells topped up with electrolyte; removes short circuits caused by positive and negative plates touching, by inserting new separators; cuts out and replaces faulty plates; takes readings of voltage, current, and specific gravity, by means of voltmeter, ammeter and hydrometer; "boosts up" low cells, i.e., gives an extra charge of current to under-charged cells to bring them up to normal; maintains secondary batteries generally. one of a gang of two or three men employed under a cable machine driver (318) q.v. on a machine which coats cable with vulcanised bitumen; feeds machine, by hand, with cable, already sheathed with tape, cotton or other material, from a drum; puts small pieces of rolled bitumen, by hand, in a worm-fitted feeder, which passes bitumen into a small steam-heated chamber, through which cable passes and in which heated bitumen is forced round cable as it passes through a die; fits end of cable on to receiving drum as it emerges through water trough where bitumen is cooled and hardened. feeds vulcanised bitumen compound, for insulation of cables, between a pair of heavy rollers; starts and stops machine by means of levers. (ii) (on cable ships) seaman cable hand; handles cables on cable ship engaged in laying or repairing submarine cables, and assists in general upkeep of ship; obsolescent term. moves levers to start and stop automatic machine which is fed with wire from a drum and with tape, cotton, hemp, rubber and/or other insulating material, usually from spools; replaces empty spools with full ones as required; guides wire and insulating material into machine at commencement of operation; watches correct working; regulates speed of machine by means of levers; repairs broken material when necessary. one of a gang of men employed in tank room; bares end of cable with a knife, lifts cable on drum into water tank with a hand lift; connects ends of cable which are clear of the water with wire to switchboard; switches on current to test cable for insulation and pressure; removes drum holding cable by hand lift after test. (ii) cleans finished lamps, by hand, with cloth and pumice powder before name is etched on. (ii) (in small works) mixes compound, by baud, over fire, stirring it with a rod as it boils. removes carbon brushes (used in electric motors and dynamos) from mould after they have been cast; places them in grill-shaped frame, and inserts in a pickling vat containing a copper solution; removes when process complete. binds, whips, and finishes into convenient lengths, using small spindle lathe, cords which connect telephone receivers to instruments. assists cord examiner or cord repairer (311) q.v. moves levers to start and stop machine which forms telephone cords and laps them with cotton; feeds machine with spools of cotton and with wire from a drum; guides cotton and wire through machine at start; regulates speed of machine; repairs broken cotton when necessary by tying ends together. operates, by means of levers, machine which covers bell wire or other wire with cotton; replaces empty cotton spools with full ones; guides cotton from spool and wire from drum through machine at start; repairs broken cotton, when necessary, by tying ends together. see coverer, cotton ; coverer, silk; coverer, wire. cotton covering machine tenter, coverer (cables, electric wires); as for cable machinist. (ii) operates, by means of levers, machine which covers fine wire with an endless rubber tube; replaces empty spool of rubber band with full spool; watches correct working of machine. a wire coverer q.v. operating a machine which covers wire with gutta percha; feeds machine with hot gutta percha and wire; regulates pressure of gutta percha to die through which wire passes; attends water troughs in which covered wire is cooled (and gutta percha hardened) and drums on which it is wound. a wire coverer q.v. who operates a machine which covers wire with india rubber. makes platinum joint in carbon filament lamp, by heating it electrically under oil. attends to running and cleaning of desiccator, used for drying-out lead-covered cables. sets washed bulbs (see washer, bulb) on spigots through which hot dry air is blown, so that interior of bulb is thoroughly dried; removes dry bulbs to tray. places plates of electrical accumulators in drying oven, and removes them when dry. assists electrician (307 or 311) q.v. or electrical wireman (311) q.v. by bolding material, passing tools, and doing other unskilled auxiliary work; sometimes screws tubes, drills walls, fits wooden plugs for securing tubes, wires, etc., and does other similar work with tools, under supervision of skilled man. removes electric lamps, recharges them with carbons, and keeps them trimmed; is usually in charge of "spot" lights when film is being taken. operates, by means of levers, machine which enamels wires, by running them through a tank of quick-drying enamel and thence on to receiving drum; guides wire from drum through machine to receiving drum at start; watches machine for correct working; refills enamel tank when necessary. seals end of cable after final tests to keep out moisture, either by dipping ends in a tank of cement or bitumen compound, or by pouring cement or compound on ends with a ladle, or by fastening lead or rubber caps, filled with compound, by hand, on cable ends; lead caps are soldered on lead-covered cables and rubber caps are fitted on rubber insulated cables and securely fastened with wire by hand. attends to portable fire used by linesmen (311) q.v. for heating soldering irons; carries fire-pot about, and waits upon linesmen generally. carries tools and materials for fitter; cleans surfaces of joints, and does work involving use of spanners, lifting tackle, and other simple tools and apparatus, under direction of fitter; assists fitter generally. sweeps floors; "lags" drums; carries raw material and finished or semi-manufactured products; does other unskilled jobs in electrical cable works. 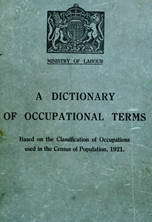 a member of a gang of men engaged in fitting wires or poles, digging trenches, laying pipes and conduits; (in Post, 0ffice service) may be either a "skilled workman" (311) or a labourer. cuts up thin metal plates or mica sheets, to dimensions required, by guillotine (band, treadle or power). general term applicable to any worker engaged in insulating electric wires, coils, cables, etc. holds work and tools for cable jointer (311) q.v. ; lights fire, heats metal and box compounds, helps in excavating (if necessary), and assists cable jointer generally. (ii) overhead wires and cables, fixes poles, and assists skilled workmen in erection of overhead wires and cables generally. a labourer (G.P.O.) q.v. employed in telegraph service. a labourer (G.P.O.) q.v. employed in telephone service. assists linesman (311) q.v. ; work similar to that of electrician's assistant q.v. cleans lugs of accumulator plates with a rotary brush, or by hand. a machine attendant (or one of a pair of machine attendants, working together) who pass thin cable, or wire, from one drum, through an automatic measuring instrument, on to another drum set in motion by machinery; watches indicator, and, when enough cable or wire has been wound, cuts wire or cable; takes coil so wound off drum, and binds it round with tape, string, or wire; re-connects drum, replaces it on frame, and repeats process; keeps record of number of coils wound. assists meter tester (308) q.v. in meter repairs and testing, and works under his supervision. (ii) dips them in acid to produce an obscuring effect thereon. one of a gang of men who place cables, previously wound on a drum, in a steam-heated drying oven, using band lifts; replaces door of oven by means of band lifts and clamps it in place; watches instruments which indicate steam pressure in oven jacket or pipes; unloads cables from oven when dry. paints binding material over joint between filament and leading wire of carbon filament lamps. starts and stops, by means of levers, machine in which studs are heated by gas jets as they revolve in machine, and in which pins forming filament support are automatically inserted; feeds machine with glass studs and with wire; removes studs, with pins inserted, and puts them in a tray. attends stove used for drying accumulator plates after they have been pasted. trims accumulator plates in a guillotine. operates circular saw, which cuts lead castings or other material, as required, in making parts of accumulators. takes various component parts from store to assembler's or mounter's bench for assembling; may also prepare small parts or components by filing, varnishing, or otherwise, in readiness for assembler; sometimes specifically designated, e.g., accessories preparer, telegraph instrument preparer. assists sample maker (318) q.v. in simple operations. see cable hand (on cable ships). sorts lamps according to their rated consumption and pressure. operates, by means of levers, machine, fitted with several pairs of rollers and a spreader, which coats paper or fabric (to be used for protecting cables) with waterproof material; feeds machine with paper or fabric from a reel and regulates supply of waterproofing material from a feeder; removes reel of paper or fabric when waterproofed. (ii) one of a gang of three or four men attending a stranding machine (as described above) where thirty or more wires are being stranded. starts and stops, by means of levers, machine which is fed with impregnated bitumastic tape from spools and with cable from a drum and which automatically covers cable with tape; replaces empty by full spools of tape; fits end of tape-covered cable on to receiving drum, by hand; if tape breaks, joins ends together. boils tar in a tank over a fire for coating armoured cables. in training to become a tester (308) q.v., and engaged in simple tests, e.g., tests rubber, composition, metals or other materials by chemical tests or by applying heat or by passing current through material to test resistance. places bulbs on trays in tanks of hot water before they are made up into lamps; removes trays and allows bulbs to dry naturally or passes to dryer-out. supervises winding of cable round a mechanically-driven wooden drum or, if cable is light, sometimes revolves drum by hand; watches to see that cable is winding evenly; signals to driver of engine supplying power for winding process to stop when enough cable has been wound; helps in removal of drum from frame when filled and in inserting empty drum by hand lifts. places a coil of copper wire on a loose cone or capstan and allows wire to pass through his hand to metal bobbin or small drum, which is made to revolve mechanically; regulates position of wire passing through his hand so that bobbin is evenly wound; stops machine, when required, by means of foot lever replaces full by empty drum or bobbin; sometimes also feeds and operates a copper stranding machine. winds cotton on to machine spools for use in cable covering. a machine winder q.v. who winds jute on to machine spools for use in cable covering. winds wires, cottons, silks, etc., from a drum on to spools of an automatic machine, for use in manufacture of cables, electric wires, etc. ; stops and starts machine by means of levers; replaces full spools by empty ones. minds a machine which winds silk on to- spools, for use in covering electric wires. a machine winder q.v. who winds wire on to bobbins or spools, to facilitate handling in further processes; joins lengths of wire together by means of electric welding tool. a machine winder q.v. who winds cotton, jute, silk, or other yarns on to spools, for use in cable covering.